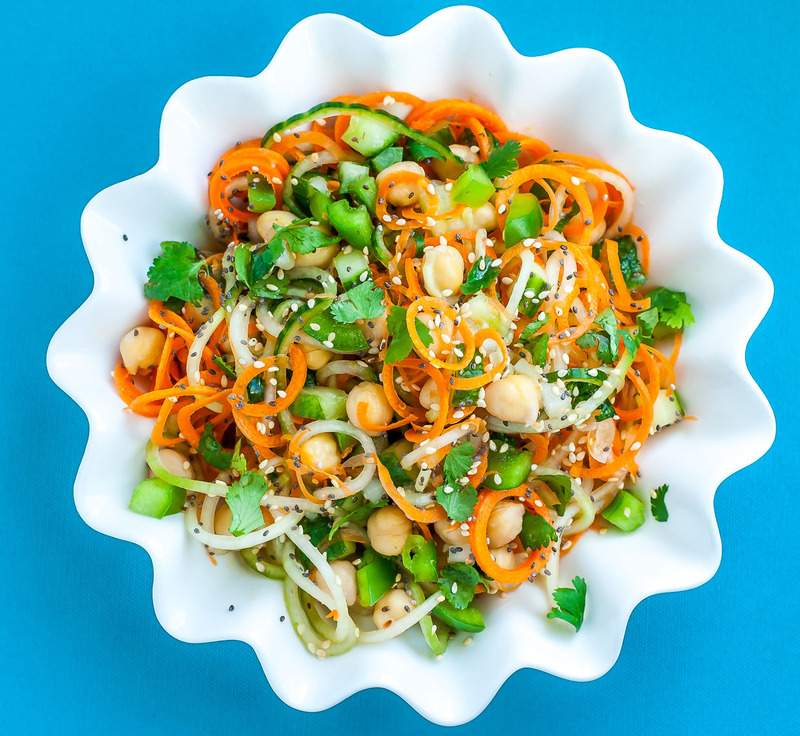 Kick up your salad game with this Thai Salad with Carrot and Cucumber Noodles! 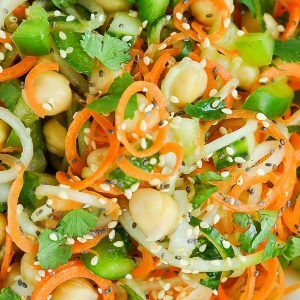 Tossed in a homemade sweet and sour dressing, this tasty spiralized Thai salad is loaded with flavor! Good. Let’s just call it good. As in, “ohmygosh I can’t stop stuffing this in my face!” good. It’s also, “screw the chopsticks and just hand me a fork already!” good. Might I also add that I’m eating this at 9 am for breakfast currently? It’s lunch-o-clock somewhere. Actually, screw good. This stuff is amazing! I officially love it more with every bite. Yes I’m typing up this blog post while recipe testing it for the first time. Considering I’m not changing a darn thing about this recipe, I decided to multi-task. And now I’m rambling. Great job Jenn! Blah blah blah please forgive my crazy and make this dish. Yes I demand that of you often, and I stand by it too. Eat. Your. Veggies. Especially super yummy pretty awesome delicious holy-cow-the-adjectives ones like these. The end. I’ll tell you a story next time. A real one, proper grammar and all. 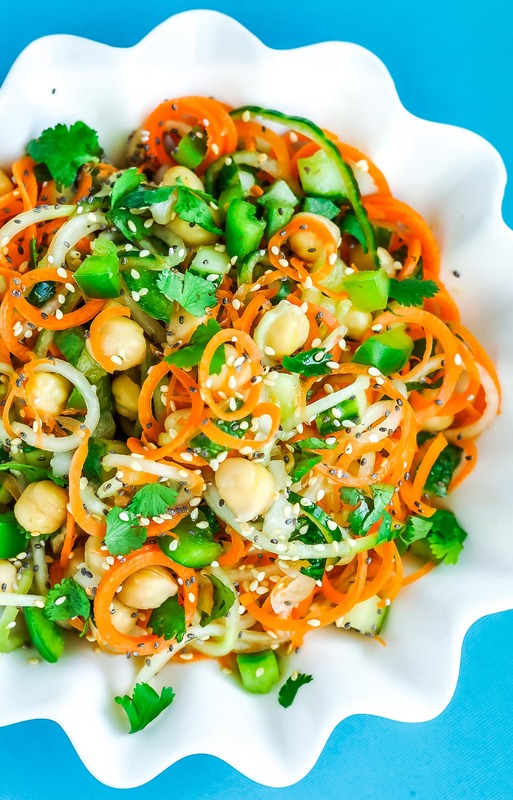 This sassy spiralized salad has refreshing cucumber, carrots, chickpeas, and peppers, and drizzled with a homemade sweet and sour sauce. Delicious! Recipe yields 4 side salads or 2 large salad bowls. In a medium bowl add chickpeas, minced onion, chopped bell pepper, chopped cucumber, and cilantro. Next, using a spiralizer or tool of choice (see post for options) curl one english cucumber and 2-3 large carrots (the biggest, thickest carrots you can find) into raw spiral noodles. See post below for special diets and swaps including vegan + paleo tweaks! Tool-wise you’ll need a spiralizer , mandolin or veggie peeler. Anything that will noodle-ize shall work! I’ve been using ::this one :: from Paderno for the past 4+ years and it’s held up through several moves and hundreds of carrot, cucumber, zucchini, sweet potato and beet noodles, plus it makes some pretty rockin’ curly fries! Love it! vegansaurus chefs: Skip the honey and make a simple syrup using sugar instead. t-rex chefs: Go veggie or go home! (then eat bacon tomorrow) Though to be fair you could totally pair this sassy spiral salad with your favorite protein. It would work great with grilled chicken or shrimp. paleo: Try maple syrup in place of honey and skip the chickpeas. notes: the chickpea and veggie mixture can be made ahead of time and refrigerated overnight if desired. Bring to room temperature before serving for the absolute best flavor and results. I would also suggest spiralizing the carrots and cuke fresh (within a few hours of serving) so they don’t lose nutrients or become soggy. Use the vinegar, lemon juice, and honey to adjust the level of sweet or tartness that makes your heart pitter-patter, it’s easily customized and even more easily devoured! 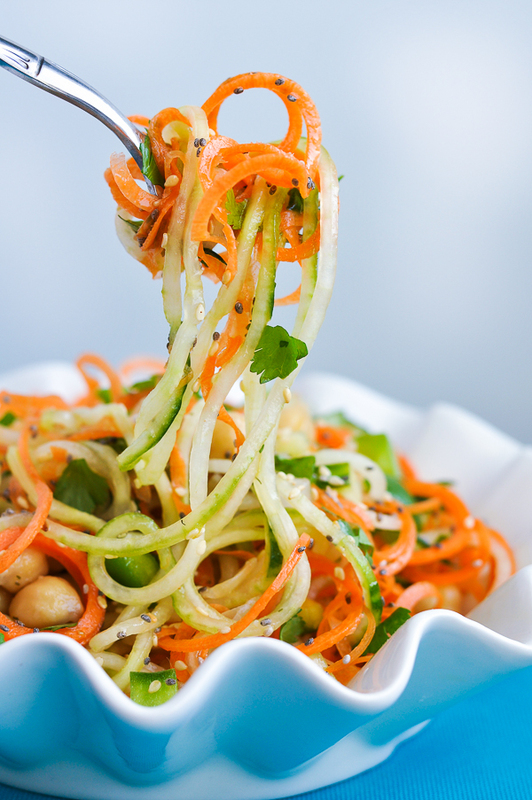 looking for more ideas for your spiralizer? The dressing is also beyond amazing over cucumber noodles! It reminds me of the cucumber salad from my favorite Thai restaurant in Virginia which is nothing short of heavenly. This makes a great lunch for two or can be served up as a side dish to feed four. Pair it with crispy coconut shrimp, pan seared salmon, or grilled chicken kebabs! Headed to a party? This makes a perfect potluck contribution. It looks impressive, can sit out for a few hours, and tastes great! If you get a chance to try this tasty Thai salad, let me know! You can leave me a comment here (LOVE checking those daily!) or tag @PEASandCRAYONS on Instagram so I can happy dance over your creations! I can’t wait to see what you whip up! * post contains an affiliate link for one of my favorite kitchen tools. This bowl is gorgeous! where is it from? Thanks Kristen! It’s a TJ Maxx find but I’ve seen it a few different times over the years so I think it’s something that can totally be tracked down! I’m not home at the moment but I can check the brand on the bottom if you’d like! That would be so awesome if you could do that when you get a chance! I loved this one! It is soooo good. Thank you so much. So happy to hear it Sylvia – thank you! This dressing is fantastic and so well balanced in taste! I used fresh lemon and lime juice, it’s so wonderful and fresh with the cilantro. I will be making this over and over again. Thank you so much! Thank you! Thank you! 🙂 So glad it earned repeat status! This salad was phenomenal! I used edamame instead of the chickpeas because I thought it would have a better flavor profile to complement the main dish I was making. I love how fresh it tastes, as well as all of the different textures (chopped cucumber, carrot ribbons, spiralized cucumber). This is definitely going in our family rotation! love love LOVE this salad! always have to make at least a triple batch! Absolutely yummy! Made a special trip to Bed Bath and Beyond to get a spiralizer – totally worth it. This salad is amazing! All the flavors and textures were just perfect! It’s light and satisfying! I’m going to bring it to a potluck next week. I just transitioned to vegetarian 2 months ago and can’t wait to try more of your recipes! Made this for tea and it was really tasty. Just one question was I meant to through everything in together or was I supposed to drain off the marinade before adding dressing? Looks amazing! One question – how many calories per serving? Thanks Jenn! Really appreciate you taking the time to respond. I will do just that! Now – off to the store to get everything I need!! Of course, it’s my favorite part of this little blog of mine! 🙂 I hope you love the salad as much as I do! Which size noodle do you make. My Paderno has an angel hair, medium and larger blade. Omg this was amazing and I brought it to work and everyone loved it!!!! This was delicious, I made it this week for dinner and had the leftovers the next day. The carrot was still crunchy. Thank you for the recipe! Just tried this and love it. I customized it a little bit. I used edamame instead of chickpeas. (I love chickpeas, but I really enjoy edamame in any kind of Asian salad.) For the chopped onion, I used green onion because I like the texture of raw green onion better than any other kind of raw onion and I feel the taste melds well in an Asian salad. Some of my family is not crazy about green peppers, so instead, I used 3/4 of a chopped Granny Smith apple to be sure we still got that sweet crunch. Also, I toasted some chopped peanuts and added them to the salad. Since only one member of our family is vegan, I made some larb (found another Pinterest recipe) to serve alongside the salad for the omnivores, and it was a lovely combination! I was sure to set out the sriracha and soy sauce, because a little squirt of each added that little kick. Thanks for the YUMMY! This was quite lovely! It tastes just so, so, GOOD. However, I have to say the liquid mix gets a bit overbearing and pools up at the bottom of the bowl, making it a bit drenched. Other than that I’m in love! Thank you Sharon!!! I’m honored you chose this dish and hope you love it as much as I do! <3 Have a fantastic weekend! Going to try this tonight for dinner; however, I do not own a spiral thingy:-/ Should I julienne or just leave as chunks? Maybe shred the carrots? Any advice? Grab your veggie peeler and shave away! The veggies will soak up more yummy dressing if you peel them into ribbons with just a basic veggie peeler <3 If you don't have that then maybe julienne and let the veggies soak up the dressing for a while before serving? I hope you love it as much as I do! Yum!!! Took a chance and made this for a friend’s bday gathering last minute and everyone loved it! I left out the chickpeas, dill, and chia since I wasn’t feeling those in a Thai salad, subbed some of olive oil with sesame oil, lime juice instead of lemon, and subbed green onions for the minced ones. Next time I make it, I will try lightly salting the prepared cucumber and leaving to drain in a collander since the cukes put off a ton of liquid and made the salad soggier than I’d like after about 30 minutes, but otherwise a keeper that I’ll make it again soon! I feel like if you kept it as is, but replaced the cilantro with flat leaf parsley, omitted the sesame seeds, and added some feta and chopped tomatoes or sundried tomatoes, you’d have an awesome Greek inspired salad. Yum! Extremely delicious salad, congrats! And the way you cut the vegetables – heaven! I was looking for a black bean soup recipe on Pininterest and found yours and your blog, and I can’t say enough that I LOVEEEE it. I’ve been checking out your recipes for the past two days and absolutely love your food philosophy as well as your stunning photos (probably one of the best food photographies I’ve ever seen). I hope you will keep posting more veggie recipes and I wish your your lovely family the best! Thanks! I am loving your blog; so it’s my pleasure to be your recipe editor 🙂 Can’t wait to make this. Ohmygosh Joy you’re a lifesaver! My friends have made this off the site already and didn’t catch my error either! Can we blame my raging mommy brain? Fixing it now! Toss them in along with the cukes and peppers! Thanks for spotting my goof! I hope I’m not overlooking it, but it don’t see where the chickpeas get thrown in? Thanks! It was modeled off the sweet and sour cucumber salad my favorite Thai restaurant serves and I don’t think they used any of those for that particular salad. In other dishes those ingredients would for sure be utilized, but this was just a simple salad they served up amuse bouche style so since they kept it simple, I did the same! no chili’s, no ginger, no lemongrass, no fish sauce, no turmeric, no galanga, no lime.. so what exactly makes this “Thai Style”? I have gotten SO MUCH use out of mine the past three years, I’d say they’re worth buying and usually are under 30$ for a decent one! Actually, maybe it’s this sauce. Will try and see. OMG! that’s not TOO far from me and I have been there! Small world 🙂 Do you know what I need to also make? The amazing sauce that goes on the seafood salad that Thai places serve. Yum Talay. Yes! I have the Paderno World Cuisine Spiral Slicer and adore it! It has fabulous reviews on amazon too! is there a spiralizer you recommend? i’m in the market! 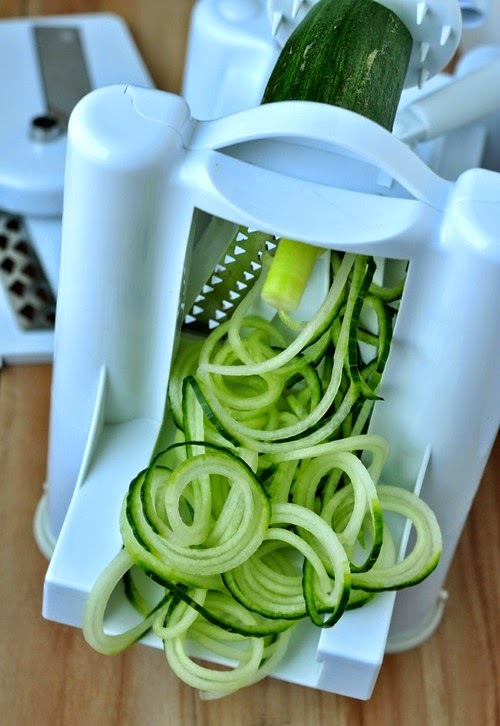 Gah I want a spiralizer now! Second day in a row I’ve seen an amazing recipe with one!! Looks amazing an fun, great excuse to get my spiralizer out. Thanks! I was waiting for this after I saw your last post – it sounds as scrumdiliumptious as it looks! This looks so awesome! I definitely need a spiralizer! This looks so so good! I think I have all of the ingredients to make this one too! I’ve got a fancy spiralizer and need to make more use of it too! YUM!!!!!!! I love these salads at Thai restaurants…add in some shrimp and BOOM. This is epic. I swear the longer they sit, the better they taste. Extra chopped nuts never hurt either.